Ash discussed all three options and fully explained the pros and cons both in terms of the required dental work and the costs for each of the options; I choose to have dental implants. The treatment was completed in several stages and at all times Ash kept me informed of the progress and on occasion the lack of progress! At this point he reinforced the other options as a way of speeding up the treatment, he fully supported my decision to keep trying to have the implants fitted. 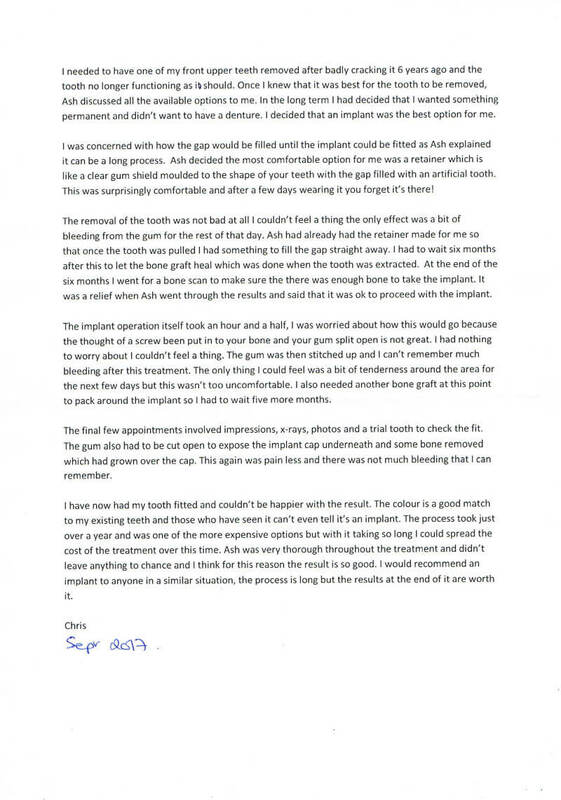 After almost two years of treatments the implants were finally installed and I’m using this testimonial to thank Ash and his team, this includes the dental laboratory and it’s technicians, for their friendly and professional approach to help me achieve a return to my previous smile. 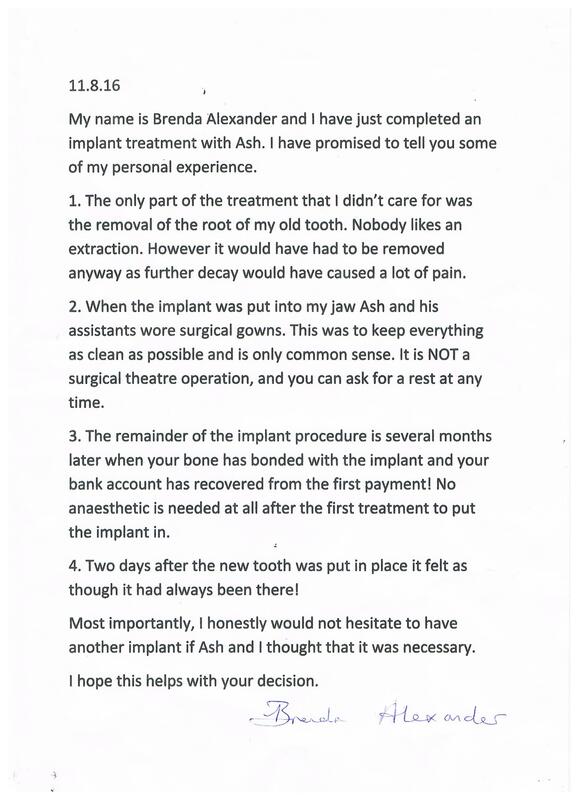 ‘I have just come to the completion of my first Implant Surgery, carried out by Ash and his team. high, throughout the procedure, Ash explained everything that was going on, including the medication. I didn’t suffer any pain, Implant surgery is expensive, but at the end of the day, it’s just like having you own tooth back. 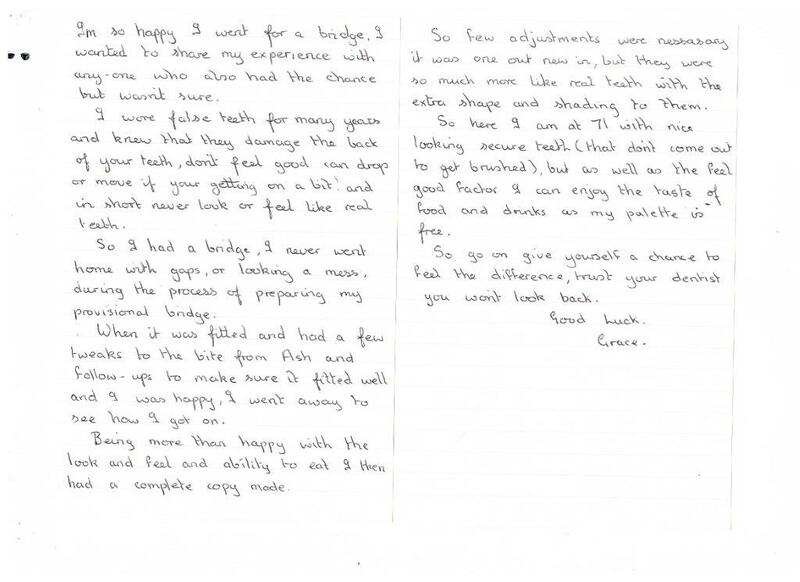 ‘I was referred to Monder by my dentist as I had problems with numerous crowns and a failing bridge. Also my bottom teeth were worn. At the review Monder talked me through his findings, the aims of the treatment and a detailed restorative plan. The treatment was painless and I now have a natural looking smile. I am absolutely delighted with the results…..far better than I thought possible. Monder is exceptionally skilled at what he does. He inspires confidence which was very important to me. ‘When Monder took over my dentistry I seemed to be in a losing battle with my teeth and the spectre of a tooth mug was looming on the horizon. The process of eating required caution as I negotiated a somewhat unstable bite, and gaps in the molar region. Following consultation the process was properly planned out and discussed with me. The work involved removal of the odd dodgy root, filling in the gaps with implants and my bite was stabilised and stains removed. During this process I felt that every care was being taken to minimise any discomfort. I am delighted with the work done. Eating is more of a pleasure and my teeth look better that they have done for years. ‘I am a new patient at Barrington Dental. I went there for emergency treatment for a tooth abscess which had spread to my jaw. I saw Dr Rachel Gibbs, who immediately prescribed some antibiotics and booked me in for root canal treatment of my tooth. Rachel dealt with this in two stages, and considering how severe the infection had been, I was amazed at how little discomfort I experienced. I would like to take this opportunity to add another review, following on from my last visit in March this year. I would also like to point out that I am an extremely nervous patient, and that in the past I have found a dentist to do whatever needed to be done, had the treatment and never returned. I had treatment under sedation with Rachel and her team in March, to say that it was a very pleasant experience would seem ridiculous considering my total fear of the dentist, but truthfully it was. Because of the kindness, consideration and patience I was treated with, I felt comfortable to return for a visit with Gill the hygienist. I am 63 years old, and this was my first time ever with a hygienist. I was still very nervous, but Gill took her time with me to explain what was going to happen during my session. Gill was so gentle, she told me that she had read my notes so she knew how nervous I was, that made me feel more relaxed because I then knew I would be looked after by her as I was previously with Rachel and the team. Gill took her time, she talked to me whilst she was looking at my teeth, she was very calming, and also complimentary about my oral care, (I do brush my teeth regularly but only because I’m scared of dentists)! I make no apologies for the length of this review, I want people to know that for the first time in my life I have made an appointment to see Rachel and Gill again in 6 months time, I am and always will be a nervous patient, memories of very painful dentistry in my youth can’t be obliterated easily, but I would like to reassure any prospective patients that in all honesty you will not find a more friendly, caring and compassionate team as here at Barrington Dental, and family and friends who know me so well will also know how I am before a visit to the dentist. Thank you Gill and thank you Rachel and team for looking after me. Just wanted to send my sincere thanks to Rachel and her team for looking after me today. I had my treatment done under sedation, and it was excellent. I’ve never ever had a dental experience which was as relaxing as it was today. Rachel had a job to do and so did her team but instead of being officious and clinical they were all extremely friendly yet at all times professional. Thank you so much. I’d like to thank you and your team there for the fantastic service you have given me. When I set out on what I thought was a pipe dream to have straight pearly teeth I didn’t really believe it could happen! But in just less than 12 months I have the teeth I’d always dreamed of, thanks to your expertise and patience! It has made a huge difference to me in terms of my confidence and smiling comes so much easier!! After a previous appointment, I was recommended to try the Sonicare Air Flosser. I have been using this for the last 3 months and as someone who doesn’t floss very well or frequently, I have to say this is “the Bomb”, I would recommend this to everyone! Thanks Rachel!!!!!! As an extremely nervous patient Barrington Dental Care has enabled me to have the opportunity to benefit from regular dental care. I was able to build up confidence and trust so that I could begin to overcome the fears that I had developed. The practice has a calming & relaxed atmosphere – from the warm, friendly welcome to the understanding, non-judgemental manner and patience shown by the medical team. This, together with the empowering supportive approach to involve you in your own treatment is the perfect environment for people like myself. Another great job by Ash, Milly and the new “assistant – Em”! The funniest 20 mins spent in a long time!! Rachel and Julia are hysterical and great at making you forget why you are here!! After a referral from my own dentist, I have travelled 130 mile round trip to see Dr Monder on many occasions. The whole team at Barrington are exceptional, the treatment received from Monder has without doubt, saved my teeth – not bad if you ask me. Excellent service and great staff, especially Vicky on reception. Monder is a great artist, who inspires confidence and puts me at ease. When Monder is unavailable always great support from Rachel if I need urgent help. All round great service! As always, impressed by the friendly and reassuring manner of the staff here, who make every effort to put me at ease at each visit. Complex treatment is always explained very clearly and all questions answered. I would not hesitate to recommend this practice. 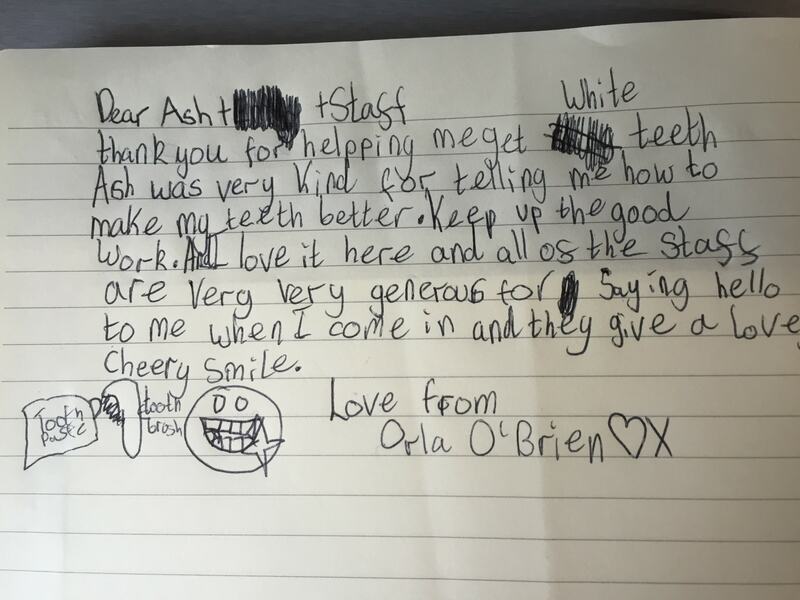 Gill, Ash and the team make coming to the dentist a fun experience always go out with a big smile even though I was a very nervous patient, Gill is very patient and thorough and Ash always listens to my needs. Excellent work – you have rejuvenated my mouth – first rate work – I would recommend you all, you take such care. Thank you.